MATERIAL: We provide Classic Designed and gorgeous new Easy to Carry Heys Disney Fairies Kids Luggage. That Disney Fairies Rolling Luggage Case is the perfect transport with its rolling wheels and fun design. Made of ABS / Polycarbonate composite and zipper closure. WEIGHT & SIZE: Ideal size for Easy to Carry. The weight is 3.7 lbs and the Dimensions 18″ x 11″ x 9″. For its medium size, it is flexible to carry and packaging. COLOR INFO: Very exclusive combination of color make an eye-catching look for kids. Disney Fairies on pink background will sure to catch your kid’s attention. FEATURES: This Heys Disney Fairies Luggage case is spacious and allows your little one to take her favorite characters from Disney Fairies along with her for any journey. Features specially designed protruding inline wheels with Metal Bearings handle. Internal Reversed-Curve Handle System designed especially for Children. WARRENTY: 100% Official Licensed Products. Customer satisfaction is our top priority, return accepted if you are not 100% satisfied as long as the products are also brand new and can be sold again, accept “no questions asked” returns for 100% refund or replacement. 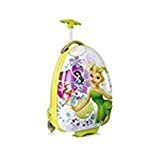 Heys Disney Fairies Brand New Excellent Designed Multicolored Super Cute Kids Carry on Approved Luggage 18 inch. Disney Kids Luggage – Fairies Designed Especially for Kids. In creating a ‘High-end’ series for Disney, our designers incorporated several children-specific features. One of these is the internal ‘reversed-curved’ handle system that curves the handle inwards & upwards closer to the child, making it much more comfortable for the child – at a low height – to hold and navigate the case. The Patent Protected design of this case also allows the wheels to ‘protrude’ out. This protrusion keeps the case elevated, so that even when being rolled at a very low height off the floor, the wheels will be the only point of contact and the case will continue to roll with ease. The cases weigh in at a mere 3.7 lbs, and feature our inline skate wheels that make their rolling even smoother, so any child can easily wheel these fun cases around. 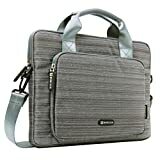 They also have a zipper closure system, that when opened reveals a beautifully lined interior as well as a zippered divider for internal organization. A large all round carryall as pictured. Olive green with a large main compartment and 3 additional pockets. Padded handles and padded adjustable shoulder strap are included. Its made from waterproofed 600D polyester with PVC backing.